Presenting to a smaller audience requires a very different approach to a crowd. The word ‘presenting’ tends to conjure up images of stages, microphones and huge audiences. But in fact a presentation could just as well be six people sitting in a room with you, particularly so for brokers, where sessions tend to draw a small number of high-engaged potential clients. Stanford Business School communications expert JD Schramm, writing in the Harvard Business Review, has come up with six basic pointers for small-scale presentations, which MBN has adapted for the brokering business. This is the collection of slides you’re reading from, and, if you lack a projector, your audience will be reading from as well. It often helps to make short handwritten notes for yourself on top of what’s in the slide – reading straight from a powerpoint presentation just doesn’t cut it anymore. Schramm advises delaying handing out the printed deck until after your initial discussion with your audience about their goals and ambitions. Once they have the printed deck you will be competing for their attention, so make sure you’re directing the presentation. If your audience is reading from a selection of printed slides, annotations and highlights can help emphasise important sections. However sometimes leaving areas blank can help draw the audience’s attention to what you’re saying, and by active note-taking better remember what you’re telling them. Another way to stop people focusing on their own print out, and engage with you and other audience members, is to bring a shared item to the table – for example a large map showing local real-estate prices, or copies of relevant application documentation. Schramm claims standing, whilst others remains seated, can give your statements more power. 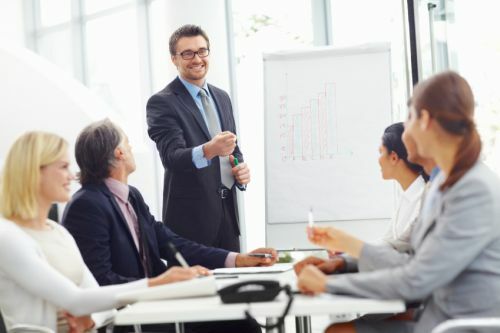 However in a small presentation standing throughout may be inadvisable; when you sit try to sit adjacent to (but not opposite) the main decision maker or most promising client, which helps you connect with them. There are some simple tips that apply to both large and small conversations: speaking from your diaphragm, standing with both feet on the ground and leaning forward slightly to talk. However for smaller presentations, when taking questions, you’d be advised to take a more relaxed stance, perhaps leaning back in your chair, in order to make yourself more approachable.